YuLianKnits… | …and crochets, and does other crafty things. 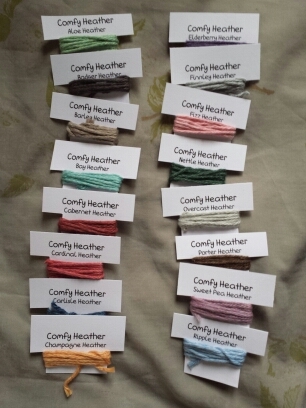 …and crochets, and does other crafty things. Sunny Spread is almost done! I recently finished crocheting all my squares and now am in the process of stitching the last ones together and working on the edge. It feels weird to know I won’t have another square to make. It took me more than 2 years to get to this point but I’m almost at the end! Fortunately I have many big projects planned to fill that gaping hole. But first, finish this sucker! It’s still November, but I’m already thinking about next year! It’s a good time to plan what goals and habits I would like to start for next year. For me, that means cleaning up my yarn shelf and taking stock of what I have and what I need to do. So many odds and ends, so many plans, but no action taken. 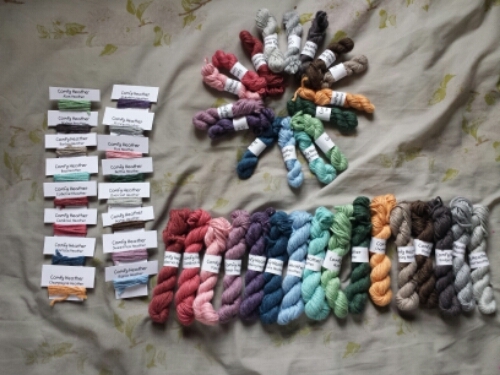 I love doing Will Work For Yarn (WWFY) swaps but I definitely need to stop doing them because I just add to my stash without using what I have. I’m making a list of small projects I can do in between my big projects and letting that be like my WWFY projects. I think the biggest appeal of the swap is that I’m not knitting for myself and I have a deadline. But perhaps having small projects to break up my big ones will be good for me. At any rate, I’m looking forward to some big life changes next year, so it’s really not a good time to be swapping! 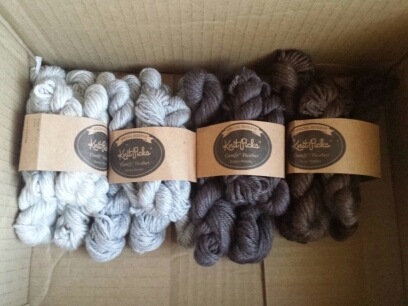 Doesn’t it look totally different from skein to cake? 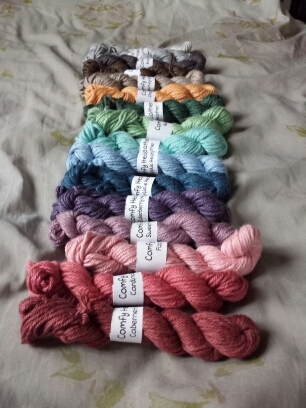 I love CorgiHillFarm‘s lovely gradients. This one is called Podcasts are Dreams and I have one more braid to spin up. This one is called Be Still My Heart, also by the lovely CorgiHillFarm. I still can’t get over how fitting the name is. 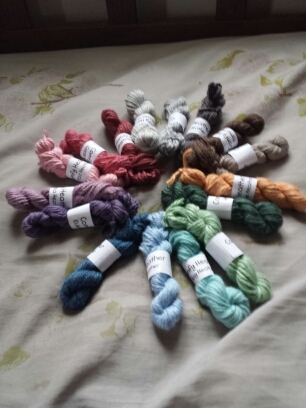 I’m spinning this for a friend’s shawl and said friend is getting married! Look at how the silk shines in the flash. And the colors are so much fun! I can’t wait to see how it progresses. I’ve gone back to spinning! Unfortunately, it’s the summer months, so I try to spin when it’s cooler, otherwise my hands get all sweaty. I can’t wait to see how the yarn turns out, especially considering I was on and off with this project. I almost had to relearn how to spin, because my muscle memory was pretty much gone. I’m also trying to finish this spinning project. A little bit everyday and it’ll get done, right? It’s been a long time, blog. And it coincides with my work getting hectic. Even my crafting has suffered. 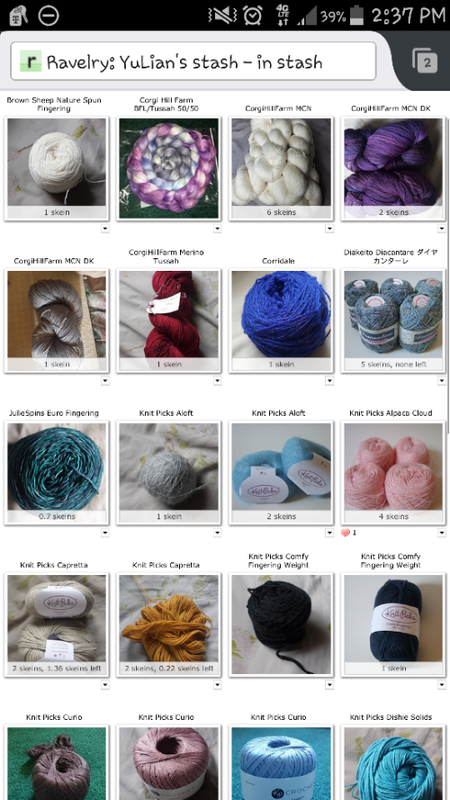 I knitted 600 yds in April, but only 200 in May, yikes! Before that was in the 1000s! 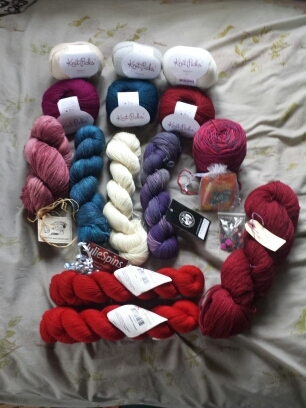 … and signed up for another Will Work for Yarn project. Fun fingerless gloves! I think I’ve been keeping busy, don’t you? I completed my first coop this past week. It was a lot of fun working on the yarn and seeing the different colors. I think I just enjoy working with yarn even if I don’t keep the final product. I started 2 weeks ago. 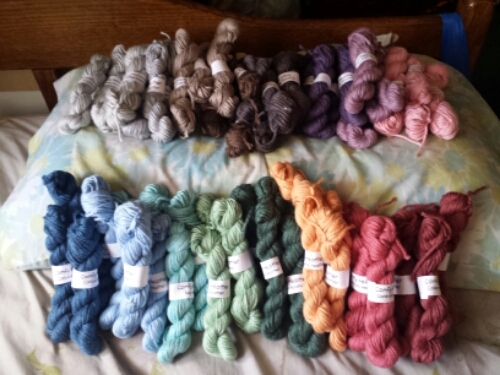 There were 16 colors and I had 3 10g skeins and 3 5g skeins. Another person also wanted a single yard. Here are all of them together. It’s so wonderfully colorful, isn’t it? These are the colors in alphabetical order. The 1 yard is so cute. I love it so much. Here is the 5g together. These are the 10g, slightly bigger. I loved making the skeins and the colors are just amazing. I wish there was a proper yellow to go along with it, though. I’m doing a second round with 2 15g and 2 10g. Perhaps I’ll do a 3rd? Haha. Which size did you like best?